Location: On Cook Inlet, Glenn Hwy 1 and the Seward Highway; 358 miles southwest of Fairbanks; 725 miles east of Whitehorse. Population: 301,000. 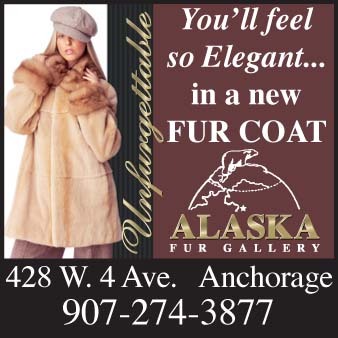 Visitor Information: Visit Anchorage: 524 W. Fourth Avenue, Anchorage, AK 99501; Phone: (907) 276-4118; Website: www.anchorage.net. 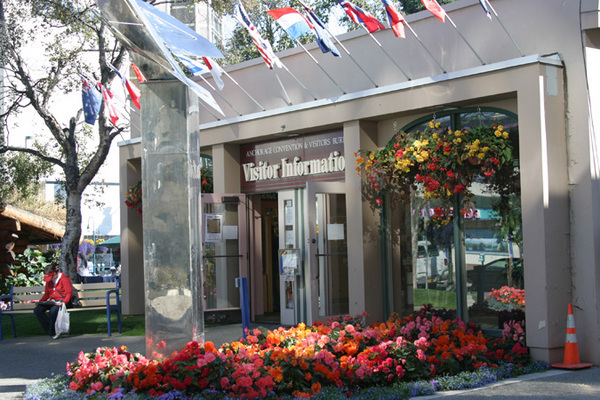 Log Cabin and Downtown Visitor Information Center: Fourth Avenue and F Street (open daily); (907) 257-2363. Surrounded by some of the most spectacular wilderness in the United States, Anchorage is a first-class destination, with all the amenities you’ve come to expect. The city sits at the base of the Chugach Mountains along the coast of Cook Inlet and lies as far west as the Hawaiian Islands and as far north as Helsinki yet it boasts a mild climate. Four mountain ranges, (the Chugach, Alaska, Kenai and Talkeetna) and the warm Japanese Chugach current combine to create pleasant year-round temperatures. 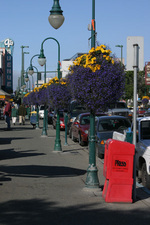 Spring through fall, Anchorage’s climate is similar to San Francisco’s spring weather; winter comparisons usually remind visitors of ski resorts in the Rocky Mountains, Canada or Europe. The Ted Stevens Anchorage International Airport serves as the primary port of entry into Alaska’s largest city. With hundreds of flights each day, reaching Anchorage via air is comfortable, convenient and time-efficient. Visitors venturing to Anchorage can also drive from anywhere on the continent, any time of the year. The Alaska Highway, which links Alaska with Canada and the contiguous United States, is fully paved and offers services all year long. Another option is to take the Alaska Marine Highway to a nearby port such as Whittier, then take the highway or railway to Anchorage from there. See the Alaska Marine Highway section of this guide for more information or go to www.AlaskaFerry.com. The parks system within Anchorage showcases some of the most breathtaking scenery in the world. Virtually every aspect of Anchorage’s unique past is represented in the historic, cultural or natural themes of these accessible parks. 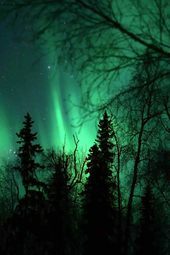 There are more than 135 miles of paved trails in Anchorage, many of which are lighted, as well as hundreds of backcountry treks. The grand Chugach State Park embraces the south side of the Anchorage Bowl and offers backcountry access literally minutes from downtown. Hundreds of trails cross through wooded areas abundant with wildlife and vistas of the Alaska Range and Denali. One of Anchorage’s more culturally diverse neighborhoods is Mountain View, an area of new and rehabilitated restaurants, specialty retail store and art galleries. Many Hmong mountain people from Thailand and Laos live in the neighborhood, and take part in a community production gardening program, selling the fresh produce at neighborhood markets. The multinational atmosphere of the city extends to the amenities, with dozens of gourmet restaurants proudly offering the cuisines of Europe and the Orient as well as traditional fare. 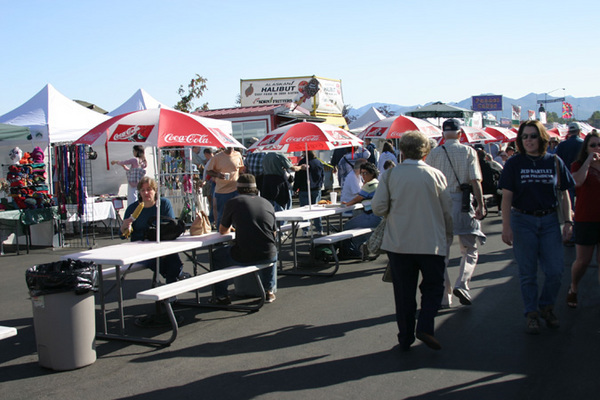 The 4th Avenue Market Place, located on West 4th Avenue, between C and D Streets, hosts daily free live shows each summer, featuring Native performers from the Cook Inlet Tribal Council. 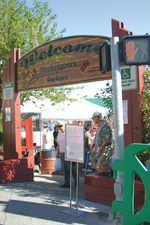 Indoor and outdoor stages provide a venue for local ensembles, musicians and storytellers, and the Alaska Experience Theater makes its home inside the Market Place. Come dazzle your senses with the Alaska Experience, a 40-minute flyover of Alaska’s most beautiful sights. The 1964 earthquake film provides a virtual adventure as you feel the earth move under your feet. Also be sure to visit the free exhibit illustrating the devastation that took place in the Good Friday Earthquake, and the pictorial history tour of Anchorage that runs along 4th Avenue at the mall. The largest Tlingit bear totem pole in downtown Anchorage stands in front of the Market Place, which provides shoppers with a variety of merchants, including Russian and Native Alaskans featuring their handicrafts and artwork, photography studios, a restaurant, café, espresso bar and nightclub. Summer hours are 9 to 9 Monday through Saturday and 11 to 6 on Sundays. The greatest challenge to Anchorage visitors is trying to determine which of many spectacular and interesting activities to do first. Activities include strolling, cycling or rollerblading along the Tony Knowles Coastal Trail, wildlife viewing at the Alaska Zoo, where Alaska species and animals from other subarctic regions are homed, climbing or flightseeing Denali, touring the Alaska Aviation Heritage Museum, fishing for rainbow trout, arctic char and grayling, visiting the Anchorage Museum at Rasmuson Center, Eagle River Nature Center, Thunderbird Falls, Eklutna Historical Park or exploring the Anchorage Coastal Wildlife Refuge, discovering Portage Glacier or skiing at Alyeska Resort, the state’s largest downhill ski area. Youth theaters, the Anchorage Opera and Alaska Dance Theatre are active and the city promotes weekly public musical offerings. Established in 1971, the Anchorage Coastal Wildlife Refuge serves as home and/or migratory stopover to more than 220 species of birds. Every season is good for bird watching at the Refuge, but the best times for viewing migrating birds are late April and early May. The Refuge is a unique blend of bird, mammal and plant habitats in an area less than a mile square and offers an unequalled opportunity to view many of Alaska’s bird species while surrounded by the awe-inspiring beauty of south Anchorage’s Turnagain Arm. Explore Alaska’s military history at the Alaska Veterans Museum, which focuses on honoring the state’s servicemen and women. Every one of the five Armed Services and the US Merchant Marines has played a role in shaping Alaska. Discover the rich mixture of the area’s Russian and Dena’ina Athabascan culture at Eklutna Historical Park, located at the head of the Knik Arm of Cook Inlet, just off the Glenn Highway Scenic Byway and within the Municipality of Anchorage. Dating back to 1650, Eklutna is the oldest continually inhabited Athabascan site in the region. Visit Eklutna’s St. Nicholas Russian Orthodox Church, originally built in the 1830s. A blend of Athabascan beliefs and Russian Orthodox teachings introduced by missionaries in the 1800s holds that when a person dies his spirit wanders the earth, searching for his earthly possessions. To keep the spirits confined to the Eklutna Cemetery, colorful miniature houses are built on top of the graves; each structure is topped with the distinctive cross of the Russian Orthodox Church. The tiny houses are painted with family colors and contain personal items of the deceased such as cups, plates, spoons, a comb, a pipe, or even a rifle or camera. Ten thousand years ago, at the end of the Pleistocene Age, Portage Valley was covered by a massive glacier, which has since largely retreated. Visitors can take a one-hour cruise or stroll along the lakeshore to wonder at hulking blue-white icebergs and learn of the Portage Glacier area’s geology and history. Three road-accessible campgrounds with 55 campsites are available to the public in Portage Valley. For thousands of years, Alaska’s Natives have produced arts and crafts that are both functional and beautiful. Decorative pieces crafted from animal skins, ivory, bone, grasses and many other materials have allowed Natives to memorialize the history and traditions of their ancient cultures. The Alaska Native Heritage Center is the first-ever visitor attraction to share Alaska Native traditions through educational programs. Visitors enter the Center through the Welcome House, which has interpretative displays, a theater hosting a film presentation and daily performances of traditional Native dance troupes. A trail will introduce visitors to Native Tradition Bearers, artists and performers as they tour five village exhibits surrounding a lake on the 26-acre campus. At Crow Creek Mine, visitors can pan for gold as miners did nearly one hundred years earlier, or hike part of the famous Iditarod Trail, which linked the port town of Seward with interior towns and villages before the advent of rail and roads. Alaska is renowned for its outdoor life, replete with cool, clear air, breathtaking scenery and accessible wilderness. Anchorage’s many top-notch outdoor facilities are just minutes from first-class downtown amenities, so it’s easy to explore the area’s pristine wilderness by day and still be back in your hotel room or a top-quality restaurant in the evening. Seasonal activities include wildlife photography, hiking and climbing, horseback riding, fishing, hunting, target shooting, boating, rafting, biking, camping, golfing, tennis, dog sledding, ice skating, skiing and snowmobiling. For Nordic skiing enthusiasts, Anchorage is among the top competitive venues in the world, having hosted U.S. Olympic trials for cross country and biathlon competitions. More than 150 parks offer a variety of trails and open spaces for all types of ski touring. Within the Municipality of Anchorage there are three downhill ski areas to accommodate alpine skiers at any level of proficiency. Dog sledding has long been synonymous with Alaska’s colorful history and is the official state sport. Fur-cloaked trappers and parka-clad Alaska Natives perched on the runners of birch dogsleds are the images most frequently envisioned by visitors when they think of Alaska. Whether visitors stay on the sidelines, or jump into the basket of a sled, the experience is sure to afford them lasting memories and an appreciation for Alaska’s pioneering days of adventure and discovery. Anchorage also offers sports fans the opportunity to watch some of the highest quality athletic events anywhere in the world from the Iditarod Trail Sled Dog Race to collegiate volleyball, basketball and hockey. The Anchorage Fur Rendezvous is North America’s largest winter festival and takes place each February. Extolling the unique aspects of frontier life, this event celebrates the camaraderie of the Last Frontier. Two weeks of festivities include authentic Native Alaskan blanket toss, Native arts, river ice bowling, the Frostbite foot race and a host of other wacky events. Anchorage lies in close proximity to several locations for trophy-class salmon and trout fishing, including the nearby Susitna River drainage. This area is known worldwide for its tackle-busting king salmon and anglers often return with fish weighing in excess of 65 pounds. Anchorage and the surrounding towns offer a wide and flexible range of fly-in fishing options to suit everyone’s budget and fishing adventure vision. The Slam’n Salm’n Derby is a king salmon derby held on the banks of Ship Creek near downtown Anchorage. The dates for 2016 are June 10-19, from 6am to 11pm, closing at noon the final day with award ceremony following. The derby is a fundraiser for the Downtown Soup Kitchen, with lots of great prizes and fun for all ages. Visit www.shipcreeksalmonderby.com. Saltwater fishing for halibut, salmon and ling cod is outstanding and easily accessible from nearby Homer on the Kenai Peninsula or Whittier and Seward on Prince William Sound. Non-resident fishing licenses are available from the Department of Fish and Game, or from many local hotels, sporting goods stores and air taxis. There are many rafting adventures awaiting the Anchorage visitor. The thrill of shooting a narrow canyon, or the tranquility of floating down Old Man River are both just a short distance from your hotel. Recommended southcentral Alaskan rivers for affordable rafting trips include the Little Susitna, Upper Deshka system, Upper Kenai, Willow Creek, Talkeetna, Gulkana and Talchulitna. Alaska travelers are demanding value from their vacations, and Anchorage offers tremendous opportunities to see and enjoy Alaska on a budget. Here are some free or low-cost attractions found in the Anchorage area: Tony Knowles Coastal Trail, Eagle River Nature Center at Chugach State Park, Visit Anchorage Visitor Information Centers, JBER Wildlife Education Center, Alaska State Trooper Museum, Alaska Fire Department Museum, Alaska Center for Performing Arts, Alaska Experience Center, Jack Hernandez Fish Hatchery, Saturday Market, Ship Creek Salmon Overlook, Crow Creek Mine, Alaska Wildlife Conservation Center, Oscar Anderson House, Eklutna Historical Park, Anchorage Museum at Rasmuson Center, Alaska Zoo, Alaska Aviation Museum, the Alyeska Resort and the 4th Avenue Market Place. The only zoo in the United States specializing in arctic and sub-arctic animals, the Alaska Zoo is routinely voted Anchorage’s “Best Family Attraction.” It is a private, non-profit 20-acre home for injured, orphaned, abandoned and endangered animals, which can no longer survive in the wild. Birds of Alaska, wolverines, wolves, brown, black and polar bears, moose, musk oxen, caribou and many other Alaska animals share space with exotic creatures including amur tigers, Bactrian camels, and yaks. In the summer months a guided, behind the scenes tour is offered daily through the grounds, with even closer looks at some of the animals. The Zoo also has a coffee shop and small gift store. 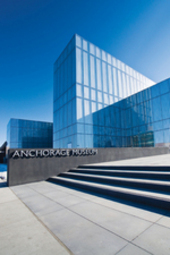 The largest, most extensive museum in the state, the Anchorage Museum at Rasmuson Center is a community institution offering top notch exhibits and programs tracing the 10,000-year history, culture and artistry of Alaska’s people from the crossing of the Bering land bridge to the present. The museum also presents a full calendar of public programs and art classes. Beginning life as a public-private partnership to celebrate the 100th anniversary of the purchase of Alaska from Russia, the Anchorage Museum opened its doors in 1968 with an exhibition of 60 borrowed Alaska paintings and a collection of 2,500 historic and ethnographic objects loaned from the local historical society. Expansions totaling over $100 million were completed in 2009 and 2010, ushering in a new era for one of Alaska’s premier visitor attractions, with the completion of an 80,000-square-foot wing and renovation of the existing building. The new Smithsonian Arctic Studies Center is a centerpiece of the museum, showcasing an exhibition of rare Alaska Native heritage objects from the Smithsonian National Museum of Natural History and the National Museum of the American Indian. The Imaginarium Discovery Center houses an interactive science center offering hands-on exhibits for visitors of all ages to explore earth, life and physical sciences, as well as the TOTE KidSpace where children through the age of 5 and their parents can explore art, history and science through play. The Thomas Planetarium hosts educational, entertaining films, and presentations that explore the night sky. Each year, numerous traveling exhibitions from around the globe are showcased by the museum, which is one of Alaska’s top 10 attractions visited by 150,000 people annually. The museum’s expert docents lead tours seven days a week during the summer. First Floor - Lobby, Museum Shop, Bob and Evangeline Atwood Alaska Resource Center. 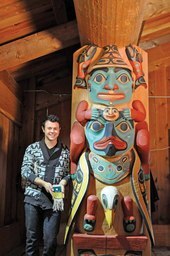 Visitors can get a bite to eat in the café with an outdoor patio, or browse the extensive selection of Alaska art, authentic Native Alaskan art and crafts, books, jewelry and more in the gift shop. The resource center invites perusal of the museum’s 400,000 historic photographs and 10,000 books. Second Floor - Smithsonian’s Arctic Studies Center; Conoco Phillips Gallery, featuring an outstanding collection of contemporary Alaskan Native art. Third Floor - Special Exhibitions. Fourth Floor - Chugach Gallery with vista viewing area. The Imaginarium Discovery Center and the Thomas Planetarium are located on the east side of the Museum. The Anchorage Museum at Rasmuson Center is located at 121 W. 7th Avenue, downtown on the corner of 7th Avenue and C Street. Call 907-929-9200; Email: Museum@AnchorageMuseum.org or visit their website at www.AnchorageMuseum.org. Visitors to the main Alaska Wild Berry Products store, located at 5225 Juneau Street, may feel like they have walked into Willy Wonka’s Chocolate Factory at the remarkable sight of 3000 pounds of milk chocolate flowing in a 20-foot cascade of silky brown waves into a luscious pool. Founded in 1946, Alaska Wild Berry uses only wild-harvested berries and carries hundreds of varieties of chocolates, as well as jams and jellies, syrups and sauces, exotic meats and cheeses, smoked salmon and halibut, Alaska books and DVDs, gift packages, Native Ulu knives and an array of canine cookies. Enjoy live entertainment, including singing, dancing and fiddling, in the gift shop and take a tour of the candy kitchens. A second Alaska Wild Berry outlet in the 5th Avenue Mall in Anchorage is a great place for a quick candy refill. More than 1000 dogs line Fourth Avenue in downtown Anchorage the first Saturday in March. The excitement is tangible as the dogs bolt through the streets to begin their quest in the Last Great Race, which relives the life-saving efforts of mushers to transport serum to the town of Nome when it was struck by a diphtheria epidemic in the early 1900s. Voted one of the Top 10 fun runs in the country by Runner’s World Magazine, the event raises funds toward the fight against breast cancer. Draws nearly 1500 women to Kincaid Park on Super Bowl Sunday to raise money for local women’s shelters. The event is one of the largest women’s cross-country ski events in the country open to all levels of amateur and professional skiers. A premier event for the Leukemia Society Team in Training, the event takes places annually during summer Solstice. The course includes a full marathon, half marathon and 5K run. With a marathon, half marathon, 5K and one-mile run, this event takes place in August along one of the most scenic routes of any national race. A winter tradition for cross-country skiers of all abilities. More than 1,800 participants annually make this March event the second largest ski marathon in the nation. A tour offered by the Alaska Railroad that transports passengers to the remote and majestic Grandview Glacier. Passengers can opt to disembark right after viewing the glacier and river raft the remaining portion of the trip to Seward. One of the premier collegiate basketball tournaments in the country takes place annually during the Thanksgiving holiday. At scenic Mt. Alyeska in September, this annual event celebrates one of the most important factors of Native Alaska life - berries. Picking the succulent fruit is just one of the many enjoyable activities. 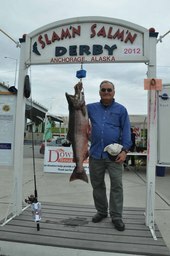 King salmon fishing derby held over a several day period in June in downtown Anchorage on Ship Creek. The Anchorage Corvette Association hosts a great show and donates all money to the Last Frontier Honor Flight, a service to fly war vets back to Washington DC for free so they can visit their memorial. The ACA’s Dave Smith Memorial Food Run is held in early June, touring from Anchorage down the Kenai to Soldotna and Seward then back, stopping at great eateries along the way. Mid-1700s. Russian trappers and hunters, called “promyshlenniki” arrived in search of furs and trade. Many Natives were converted to the Russian Orthodox religion. 1778. British Captain James Cook arrived, searching for the Northwest Passage. 1835. Russian traders and explorers established a mission near Knik, across the inlet from present-day Anchorage. March 30, l867. Financially strapped Russia sold Russian-America to U.S. for 7.2 million or about two cents an acre. The treaty was negotiated by U.S. Secretary of State William Seward. 1882. Gold was found at Crow Creek near Girdwood, just 39 miles (62 km) south of Anchorage. 1914. Congress authorized construction of Alaska Railroad, the only railroad to be owned and operated by the U.S. Government. April 10, l915. President Woodrow Wilson selected the railroad’s route from Port of Seward through coal fields in the Interior to the gold claims near Fairbanks. Anchorage selected as construction headquarters. Thousand of job seekers and adventurers poured into the area to build the railroad, living in a tent city of more than 2,000 on the banks of Ship Creek. July 10, l915. Land auction held that shaped layout of present-day Anchorage. First lot sold for $825. November 23, 1920. Anchorage incorporated. July 15, 1923. President Warren G. Harding drove a golden spike at Nenana, officially completing the railroad’s construction. 1935. Matanuska Valley Project brought more than 200 families from the Midwest to begin an agricultural community north of Anchorage. June 27, 1940. Anchorage’s strategic position attracted military interest with the threat of world war. Construction began on army base and airfield. 1942. Japanese invaded Alaska’s Aleutian Islands. In defense of the West Coast, the Alaska Highway was built in eight months and 12 days, linking Alaska with the rest of the nation through an overland route. December 10, l951. Anchorage International Airport opens with transpolar airline traffic flying between Europe and Asia. City becomes the “Air Crossroads of the World”. July 23, l957. Oil was discovered in the Kenai Peninsula, starting Alaska’s boom. January 3, l959. President Eisenhower signed the Statehood Act, making Alaska the 49th state. March 27, 1964. The largest earthquake ever recorded in North America took place on Good Friday and measured 9.2 on the Richter Scale. February 16, l968. Oil companies announced the discovery of oil in Prudhoe Bay on Alaska’s North Slope. March 3, l973. The first Iditarod Trail Sled Dog Race occurred to celebrate Alaska’s distinctive past. Starting in downtown Anchorage, the race crossed more than 1,000 miles of wilderness to Nome and commemorated the relay of life-saving diphtheria serum to Nome by sled dog mushers in l925. 1974. Construction began on the 800-mile trans-Alaska Pipeline. Oil and construction companies set up headquarters in Anchorage, fueling a construction boom. June 20, l977. Prudhoe Bay oil began flowing to Valdez, reaching the Valdez terminal on July 28. Often, flying is the only way to reach backcountry areas that offer an unforgettable experience in the pristine wilderness of Alaska. Flying is so popular in Alaska that 1 in 36 residents have a pilot’s license and towns without a stop sign probably have a landing strip. Even the capital city of Juneau can only be accessed by water or plane. There are many companies offering charter services for just a few hours or longer backcountry trips. From Anchorage, take a flightseeing trip to Denali National Park and circle the majestic mountain while looking down on the fantastic flora and fauna below, or stop and enjoy lunch on a glacier. A fly-in fishing trip is a popular way to experience an unforgettable, once-in-a-lifetime Alaskan thrill. If you are planning a trip to a National Park or Wildlife Refuge, be aware that air charters must have a permit to operate within those boundaries. Contact the park in question for a list of permit holders in their area. The type of aircraft you will need depends on how many people are in your party, type of gear, the landing area at your destination and current weather conditions. A Cessna 185 can carry 2 or 3 passengers and gear, while a PA-18 carries only one passenger but is best suited to short, rough landing areas. Pilots may require that you lighten your gear load before taking off. The cost of charter flights varies greatly from around $135/hr for one person to $415/hr for a five-person flight. You can reduce costs by taking a scheduled commercial or mail flight to the community nearest your destination. Your trip itinerary should allow extra days on either end in case of bad weather, which is often a factor in Alaska. Extra food should be packed in case you’re stuck for a day or two before pick-up. Make sure that your pick-up time and location is set in advance and not missed or you may be paying for the pilot’s time. In addition to ranking as the fifth busiest airport in the world for cargo traffic, Anchorage has the world’s largest seaplane base at Lake Hood, part of Ted Stevens Anchorage International Airport on South Frontage Road, four miles southwest of the city’s central business district. With hundreds of take-offs a day, watching the planes has become a popular spectator sport. 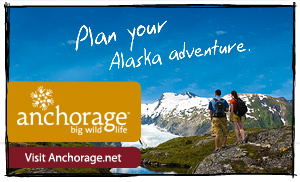 Check with Visit Anchorage for a list of charter services. Easy access to rivers, lakes and saltwater has earned Anchorage a spot on Field & Stream magazine’s list of America’s Best Fishing Cities. Anglers can pursue salmon, rainbow trout, Dolly Varden and arctic grayling right in the city. Monster halibut, trophy trout and all five species of Pacific salmon are within a day’s drive or on a fly-out fishing trip. In Anchorage, it’s not unusual to see businesspeople step out of the office, throw on a pair of hip waders and head down to Ship Creek (a stream right in downtown Anchorage where king salmon weighing more than 50 pounds have been caught!) to reel in a king or silver salmon - especially during the Slam’n Salm’n Derby in June. With divisions for visitors and kids, along with specially tagged fish, you don’t need to reel in the big one to land great prizes. Salmon viewing is plentiful along Ship Creek, but if you’re itching to put a line in the water, go rent some gear and pick up your fishing license at a nearby sporting goods store. Additionally, flowing from the Chugach Mountains to Cook Inlet, Campbell Creek Greenbelt also offers public access points and fishing in some areas. Bird Creek and Twentymile River, about 25 miles south of Anchorage, provide excellent silver and good pink salmon fishing along the Seward Highway. Anchorage is widely used by anglers as a base camp for fishing in Southcentral Alaska. The famous Kenai River is just a couple hours drive south of Anchorage. Halibut and other saltwater fishing are within a half-day’s drive. Prince William Sound (Whittier) is just over an hour away; Resurrection Bay (Seward) is 2.5 hours; and Kachemak Bay (Homer) is 5 hours south. 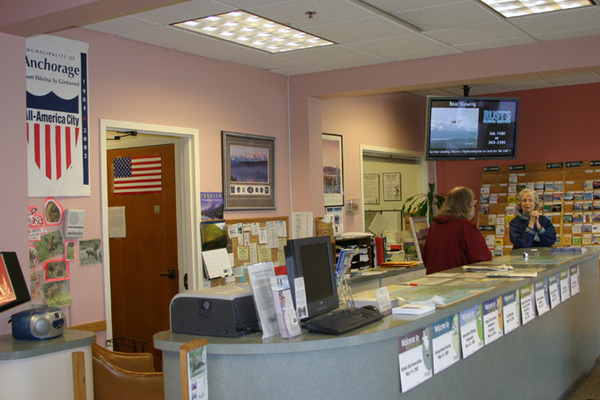 There are quick commuter flights to Kenai and Homer. Head north to the Deshka and Susitna rivers for salmon, or cast for grayling and rainbows in Mat-Su area lakes. Most air taxi operators and flightseeing companies also offer one-day fishing charters to remote Alaska areas during the traditional fishing season, as well as in winter for excellent ice fishing. Multi-day trips are also available. Please check with the Alaska Department of Fish and Game for fishing regulations, purchase Alaska fishing licenses and find current Alaska fishing reports. Where's the Travel Guide Van? WIN PRIZES!